One of my ten commandments in wine is to return to Italy at least once a month. Partly for the value and partly for a change from the norm. Most Italian wines have a ‘realness’ separating them from the copybook perfect character of New World wines. 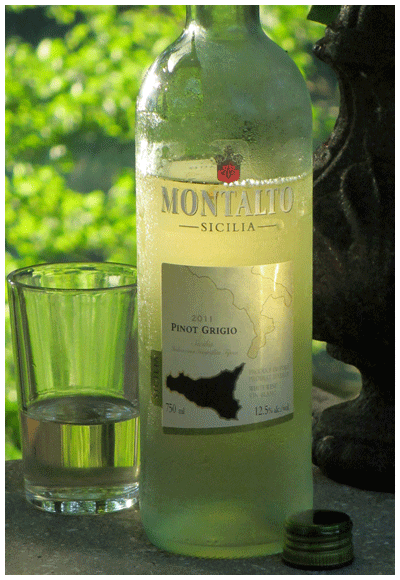 Nothing could be more normal than Pinot Grigio however the Sicilian below is more turbo charged with tingling freshness. Could be related to Vinho Verde. Amazingly good stuff for the price. Sicily is just starting to make a name for itself in white wines. we buy tons of this wine by far the best value ”’sshhhh! OK, let’s keep it a secret!